Someone’s bound to ask! The girl with the two Ugly Sisters is Aschenbrödel or Aschenputtel. What ARE "Cinderella Stamps"? [The term "poster stamps" refers more or less to the same thing.] Various definitions have been used; the simplest is probably "things stuck on an item of mail which aren’t official postage stamps". You won’t find them in a normal catalogue – even the ANK Special has only a few. The list can include local postage stamps; railway post stamps; telegraph stamps; phantom & bogus issues; wax or paper seals; registration labels; charity labels; and political & wartime propaganda. There are probably tens of thousands of such items! Note that the Personal Stamps issued by Austria are not Cinderellas, nor are revenues normally so classed. A lengthy (404 pages) treatise on the WWI issues is "For God, Kaiser and Fatherland, 1914-1918" [ISBN 0-473-02251-6] by Alan Jackson published in 1993. In this area, what you choose to collect is very much up to you. This article will show a few Cinderellas and other things; the illustrations are not all to the same scale. Back to Austrian Stamps Homepage Back to "Is this an Austrian stamp?" 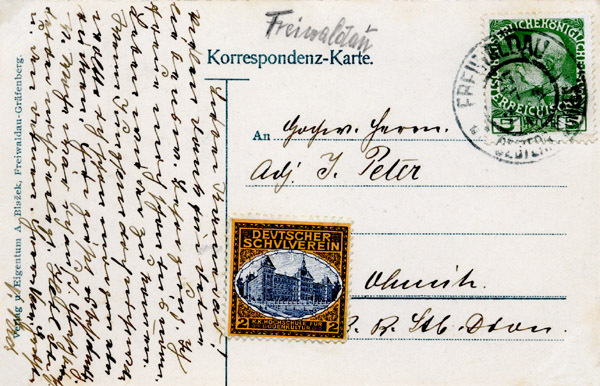 This is a piece of a modern cover, sent from Vienna to GB. 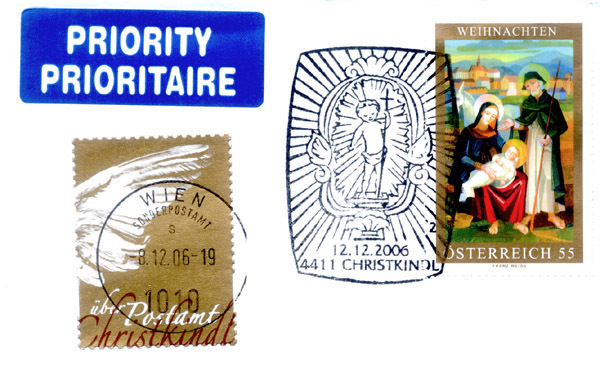 The left-hand label is gold-coloured (earlier versions are in other colours); it instructs the postal service to send the item to the Christkindl Post Office for the special Christmas cancel and it costs the same as a standard inland letter. Here, the label has been correctly cancelled by the office of posting and the postage stamp was cancelled at Christkindl; sometimes they get it wrong. The PRIORITY label refers to the speed with which the postal service handle the item; PRIORITY usually costs more and is supposedly faster. From an earlier time: political labels were printed in great quantities by German-speakers in areas they wanted to rule – especially in today’s Czech Republic & Slovakia. This is a Deutscher Schulverein label used at Freiwaldau in Silesia; the ‘2’ is the donation made to promote the cause of German culture and language tuition in schools. Below are two pieces of postcards, showing German labels used in Silesia next to the postage stamps on postcards. In theory that made the item into a letter, which would then be underfranked and charged postage due; in practice the rule was ignored if the label was in German. Here are some more examples of "things you might find on an envelope or postcard". The mark on the left shows that the item is part of a bulk mailing paid for in cash. In the centre are two typical imprints from official Postal Stationery; quite often the designs are not available as adhesive stamps. On the right is what looks like a cancelled stamp; however it is a picture of a hotel alongside a different paid-in-cash mark used for their winter brochure. Almost always, markings in blue crayon are instructional, applied by the office of posting. Blue L-marks round a stamp mean it is invalid. A blue or black capital T often followed by a fraction mean that postage due has been levied: see elsewhere. 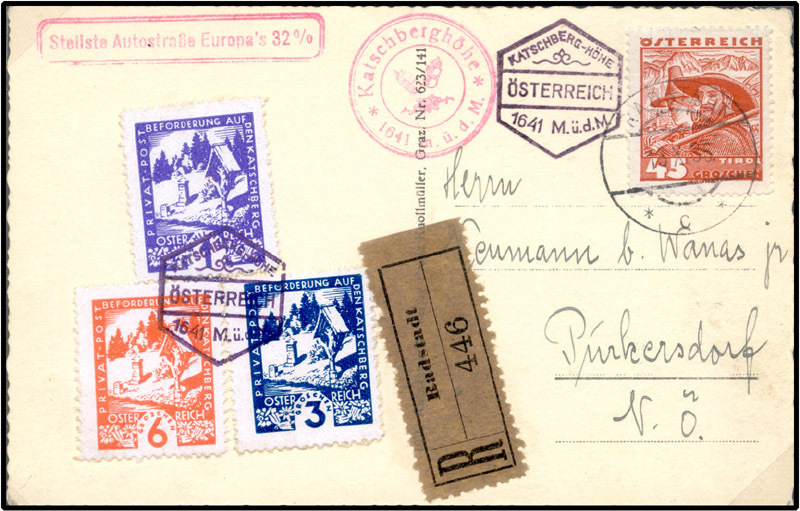 A blue number (eg 101) at the top left of a letter posted to a Vienna address probably means it went by pneumatic post: again, see elsewhere. Two bogus stamps produced by the Vienna dealer Friedl to mark the discovery of Franz Josef Land in 1873. Red Cross charity stamps from 1914. Here is a definitive stamp with a "marginal tab"; these tabs have no franking value, and occur with a variety of decorative, advertising, or political slogans. Rarely (and wrongly) they are used for franking mail. These three items however are genuine Austrian postage stamps (yes they are!) just to show that life can be difficult. The round one is printed on plastic and the ‘375’ is the face value in cents; the long-nosed figure is a character from a childrens TV show; and the APS stamp is a Personal Stamp, discussed elsewhere. You may encounter the Registration label; these began in the traditional format of a small adhesive yellow label with the letter R, the name of the despatch office, and a serial number. 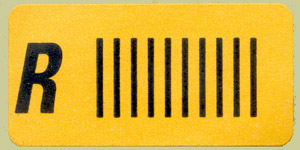 More recently they take the form of a computer-produced label with a serial number such as "RO 75452432 8 AT" and a bar code; similar labels beginning RR or CC are used for other postal purposes. So why, you may ask, do you also find an added small yellow label containing only R and a row of vertical lines? Allegedly, it is because the Post Office machinery cannot recognise the Post Office computer-produced labels! The leftmost label above is propaganda in favour of the Austrian People’s Party candidate in the 1960 Presidential Election. In the middle is a pair of "cut-outs", ie pieces cut from postal stationery so as to include the imprint and then used to frank an item – this was sometimes permitted, sometimes tolerated, and sometimes forbidden. On the right are a pro-German-language (and culture) item and a WWI patriotic label. This is a Blackprint. Since 1946 the Austrian Post has produced a so-called blackprint version of most issues (it’s actually printed in ‘shades of grey’). Originally intended for the editors of philatelic journals, they were soon in demand by collectors – and naturally were placed on sale. Since 2000, "Buntdruck" have also been produced, stamps of the identical design to a normal issue but in different colours. Neither have any franking value, but they can sometimes be found illicitly used by enterprising philatelists. These are not Cinderellas, but postage stamps from automatic slot machines! Left is the Schilling-currency version; it wasn’t popular. Right is the Euro version; the background design is location- or event-specific and they are much sought after at exhibitions. They are valid for franking, alone or with other stamps. In the 1920-38 period, several hotels and guest houses in remote regions organised their own postal service, an employee taking guests mail to the nearest post office. This they charged for, and some printed and sold "adhesive labels indicating the payment for this service". This produced conflict with the postal authorities, who while refusing to collect mail from the hotels even if paid, also refused to allow anyone else to! One of the better-known examples is Katschberghöhe, on top of a mountain in Carinthia. 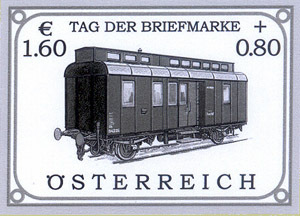 Austria occasionally produces block issues, having both postage stamps and non-postal labels. 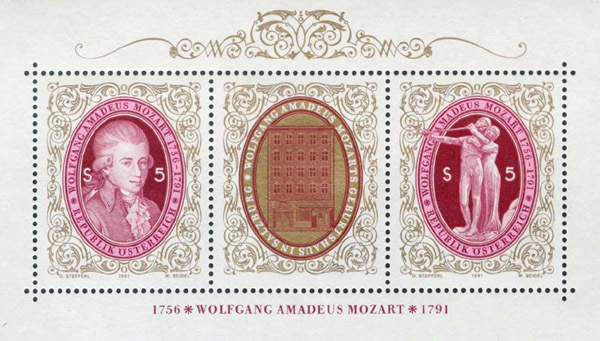 A good example is the 1991 "Mozart 200th death anniversary", with a central label flanked by stamps. As before, the label is not postally valid but can be found used. 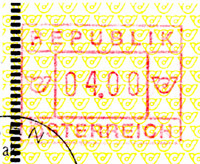 It is less uncommon on FDCs, where one can apply the left stamp alone, or the right stamp alone, or the left stamp plus the label, or… A greater source of such peculiar frankings comes from the 1969 3x3 block "100 years of the Vienna Opera House", which has a central label surrounded by 8 stamps; the catalogues list 16 possible arrangements that include the label! 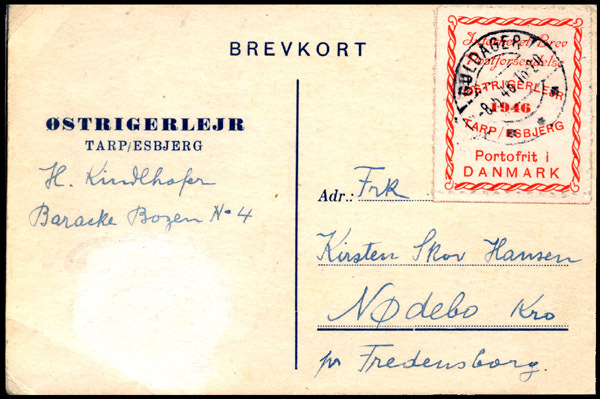 As the final example, this card bears a "Tarp Label", produced for a free postal service for Austrian refugees in the Danish Red Cross camp at Tarp in the spring of 1946.